The first month of 2019 is clean out of the way. You have just received your first paycheck and you’re struggling to decide what to do with all that leftover money you have after paying off Christmas. Like many of you, we’re all scratching our heads to try and figure out where to spend that spare €9000 we have taking up valuable wallet space, but worry no more. We’re not so keen on the display placement. 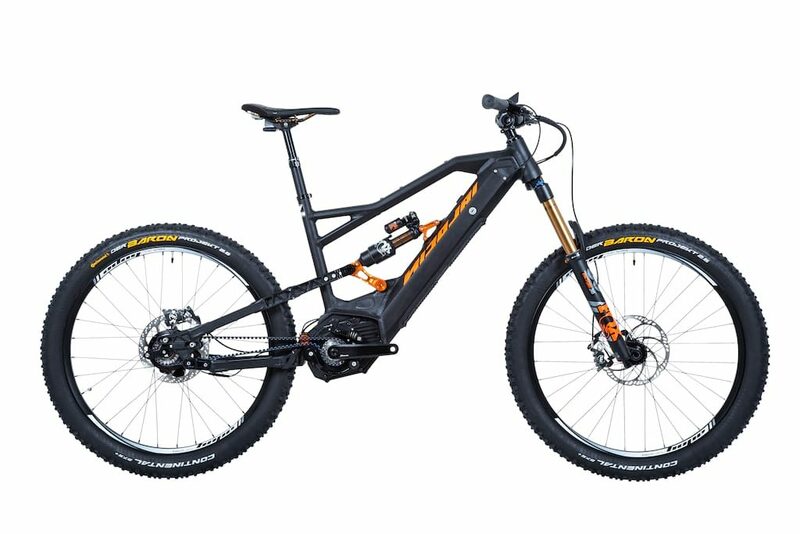 German bicycle engineers, Nicolai, have updated their EBOXX eMTB for 2019 and is now offering the angular mean machine with a Rohloff 14 speed hub gear and Gates Carbon belt drive for just €8,999.00 leaving you with just enough change from 9000 grand to buy a packet of Monster Munch to celebrate with. 14 speed hub gear + Gates Carbon drive = Zero maintenance. 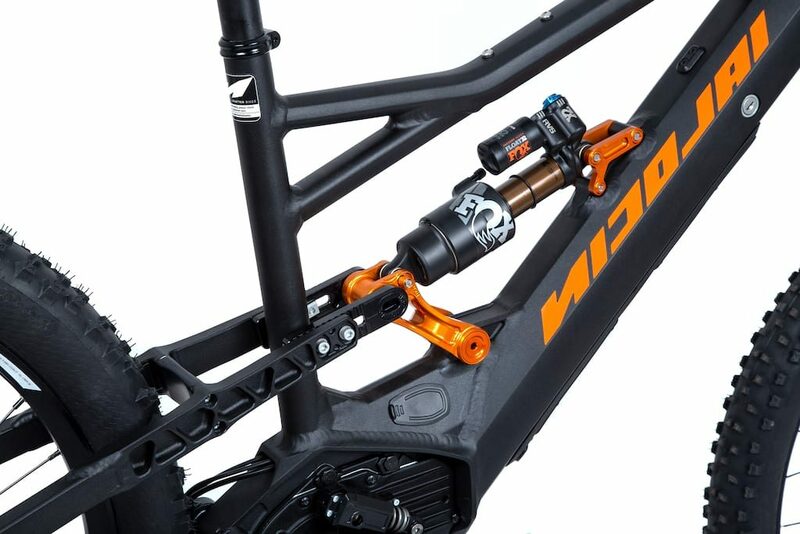 The Bosch powered eMTB is handcrafted in Germany at Nicolai’s own factory, which is never going to come cheap, but the high-end build kit which includes top of the range Fox suspension, SQLAB bars, and UK made Hope components don’t help with the overall price either. While the low maintenance and zero oil Carbon Gates/Rohloff build of the EBOXX is sure to be the most lusted after model, Nicolai does also offer a more “affordable” EBOXX QLFLINE build with the same handcrafted alloy frame, Bosch CX motor and integrated battery, but more conventional SRAM GX 11-speed drivetrain all for just €7499.00. Below are the specifications for each bike plus the most detailed press release we have ever received from any brand. ROHLOFF equipped 14 speed EBOXX. NICOLAI has been building mountain bikes for over 20 years, and for over 10 years electric assisted ‘eMTB’. The question „Who needs that?“ or the quote „I am still too fit for that,“ is rarely heard today. Why? Because people who are interested in e-bikes quickly learn that riding an eMTB is still sport. The advantages are obvious: differences in fitness between friends are levelled, the range is increased and ultimately, you can have longer riding time and pleasure. 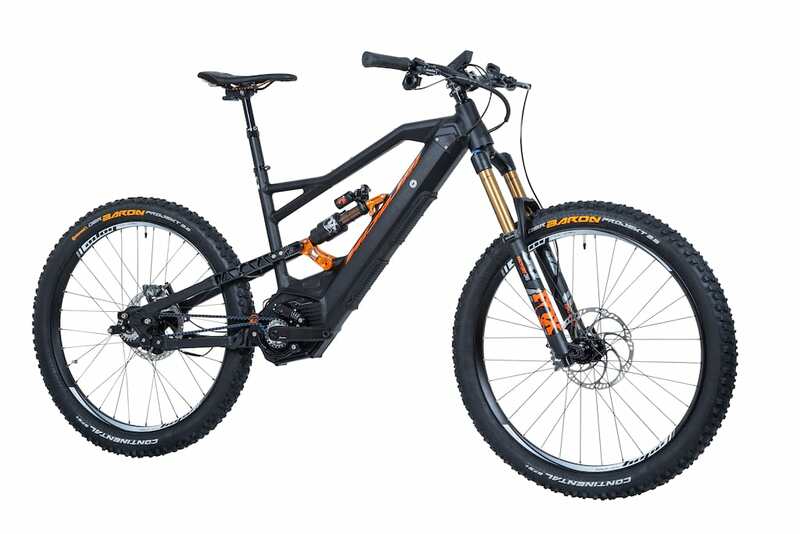 For this year, Nicolai’s eMTB called the EBOXX-2019 is developed and produced precisely for this riding experience. This is a special product because Nicolai is one of the few remaining companies to produce bicycle frames in Germany. In our own factory, all components are CNC-milled from high-quality aircraft aluminium and precisely welded together. The high-quality welding beads have established themselves as a trademark in the industry. A Nicolai bike can therefore also be recognised without a logo. The top of the line model with 14 speed hub gear. 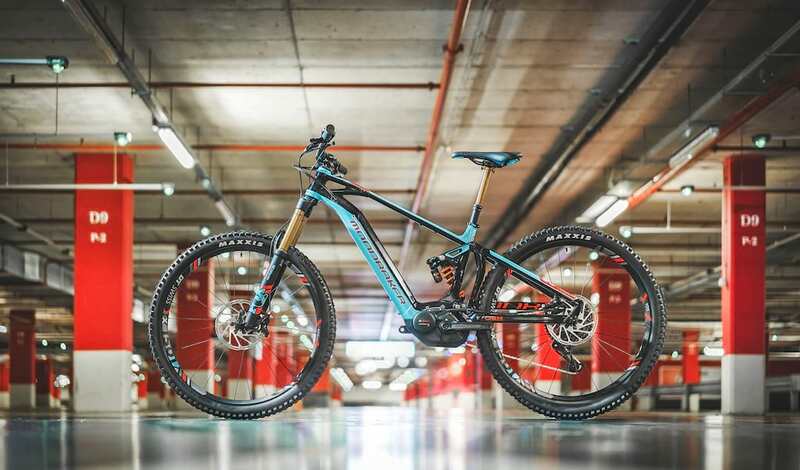 What will the eMTB of the future look like? The EBOXX E14 is our answer to this simple question. All our experience from 23-years has been collated here. Here, historically grown roots are cut. The derailleur and chain-driven gear system gives way to the durable Gates belt drive in combination with the almost indestructible Rohloff hub, which can even be electrically shifted under load in this bike. Kalle Nicolai says: „It goes without saying that Nicolai only selects very high quality components for the complete bike. Exactly the ones we have tested and also continue to use ourselves. In other areas of performance, we continue today with our so-called Geolution geometry for increased safety, traction, and speed, in all riding situations. NICOLAI reflects on a long and close cooperation with the technology company Bosch. 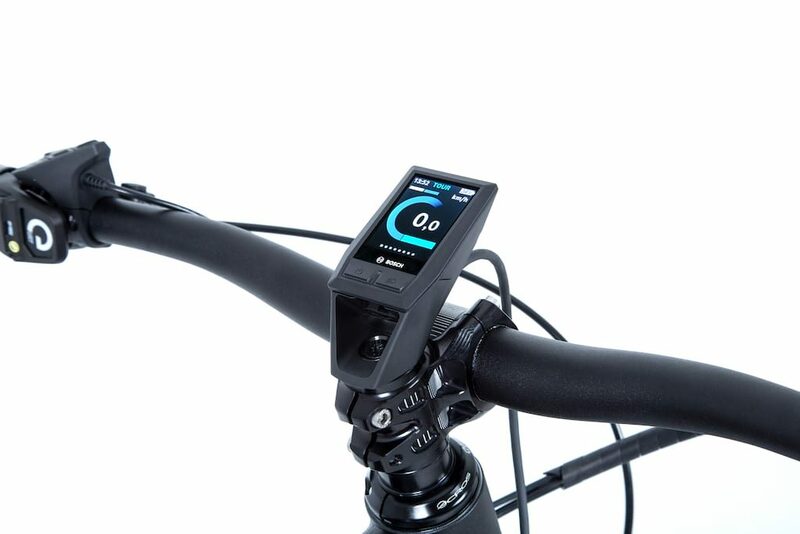 Therefore we continue to use the strong Bosch CX motor with specially-tuned mountain bike software in the EBOXX bike. 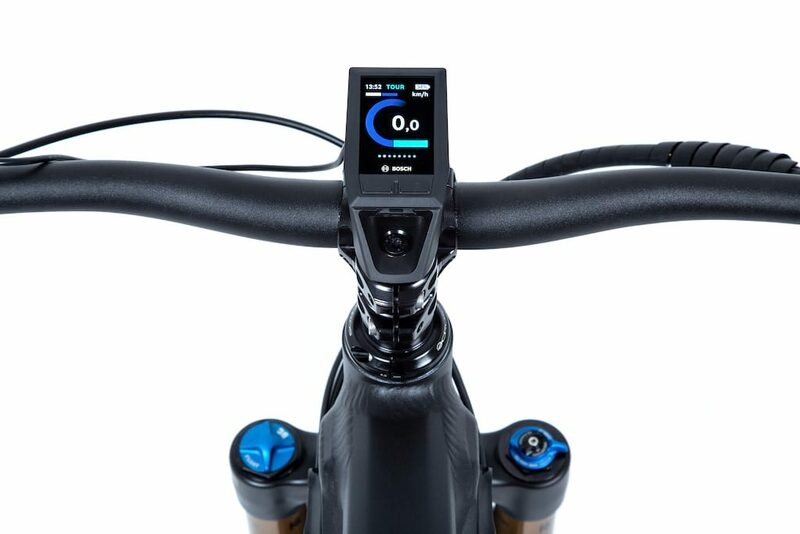 New for 2019 is the KIOX on-board computer with all the functions a real rider needs. The small, scratch-resistant color-display is controlled by the operating unit with improved ergonomics at the left grip. It provides data on riding speed, power, heart rate, battery charge and much more. The magnetic holder makes it easy to remove and attach the on-board computer while keeping it firmly in place. The 500 Wh battery is fully integrated into the down tube and can be charged on or off the bike. Low maintenance Gates Carbon drive. Forget the days of oil-smeared chains and join the Gates Carbon Drive Revolution. Clean, smooth, robust and light. These are the advantages of the Gates Carbon Drive™ system. The carbon reinforced belts are as stiff as a chain, have a longer life, run dry without lubrication and are virtually maintenance free. With an Ebike, the motor power and human power must be transmitted together to the rear wheel. 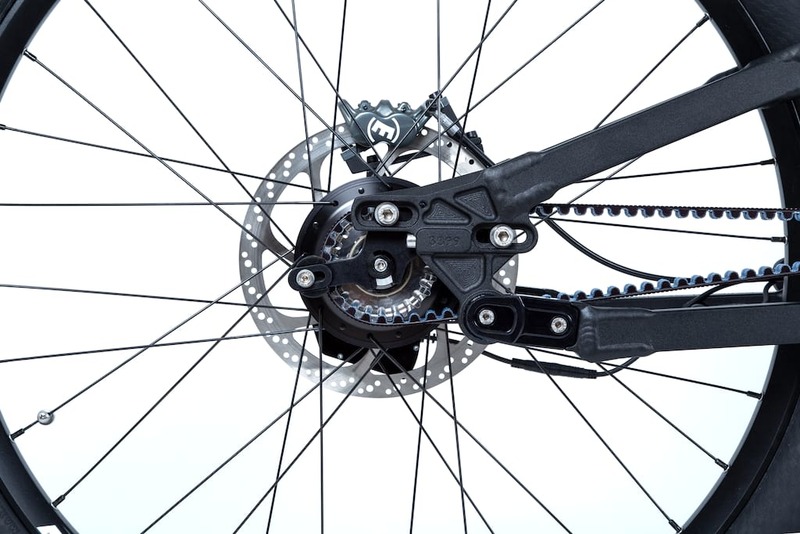 Derailleur gears therefore wear relatively quickly in this application. 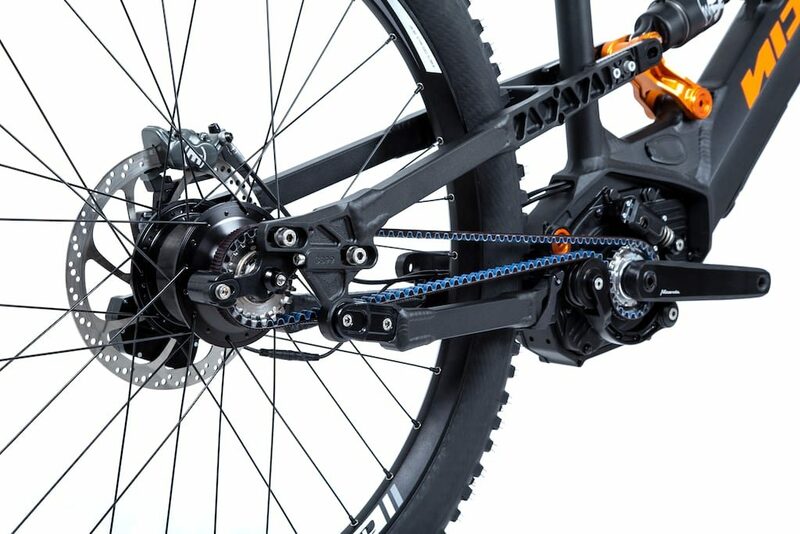 We wanted to change this and developed the Nicolai EBOXX E14, the world‘s first E-MTB equipped with a GATES belt drive. Designed and optimized for all off-road riders. The manufacturing of Nicolai products in Germany gives Nicolai the necessary flexibility to adapt its products to the special needs of its customers. A correct posture on the bike can only be achieved by selecting the right frame size. The 5 frame sizes S,M,L,XL and XXL offer the right product for every customer between 1.55 and 2.10 meters tall. For a low step through height we manufacture the „S“ frame with a round top tube and all other models M to XXL with trapezoidal top tube. 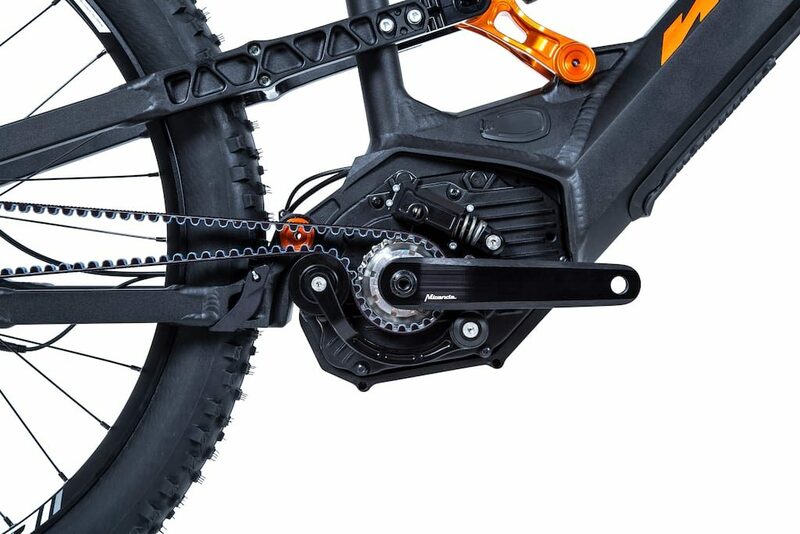 The new Rohloff E-14 transmission sets standards for shifting e-bikes – shifting has never been more comfortable. Combined with the Bosch motor, the unique fast shifting performance and easy operation is a pleasure to use. One push on the button, and the drive removes load from the system, and the Rohloff hub switches electrically. Hold down the button and the E-14 shifts all 14 gears in a fast 3-speed sequence. And when the trail forces you to stop , it automatically returns to the starting gear. For 2019, we now have improved the position of the electronic trigger to achieve the best intuitive operation with the thumb. Fox suspension front and rear. 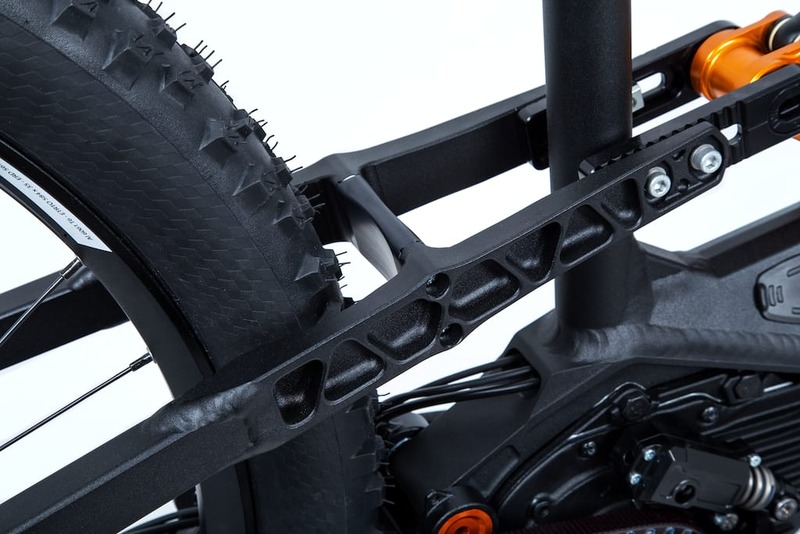 The rear end of a mountain bike chassis is not a structural rigid component. It is exposed to extreme loads during off-road driving. That‘s why we only use the best suspension components from the US specialist Fox. Typical critical points are also the ball bearings, which ensure low breakaway torque and optimum response in the joints. In order to keep the maintenance intervals long, we only use full complement, double-sealed ball bearings which are built into the CNC milled aluminium structure. For 2019, we have further optimized the structure so that we can allow a payload of up to 150 kg. We don’t care about trends! 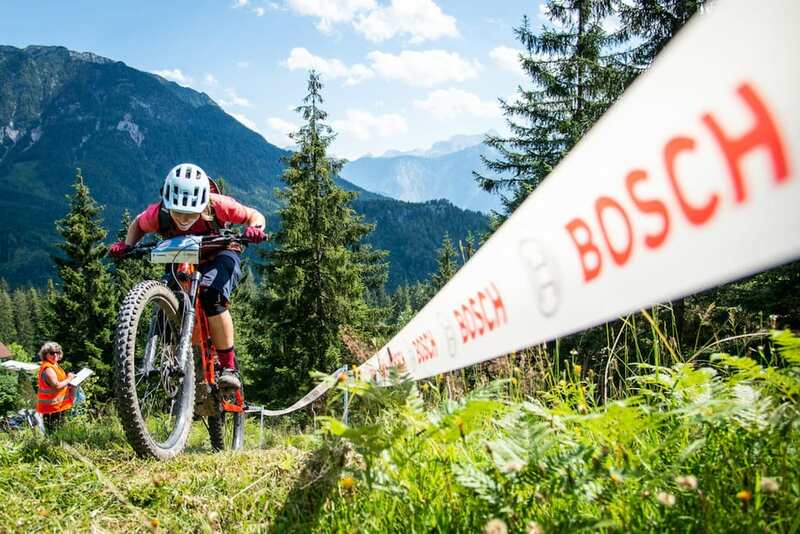 All that matters is lap times, riding pleasure, safety and the physical facts.” This quote is our approach to the development of new mountain bikes. This mission statement has made us one of the most innovative bicycle companies in terms of chassis performance, steering dynamics and geometry. GeoMetron is the geometry concept on which all current Nicolai models are based. The concept is based on the realization that a longer wheelbase, a slacker steering angle and a steeper seat angle make the bike faster, smoother, easier to climb and safer. The geometric relationship between wheels, steering angle, and weight distribution are the decisive factors for good handling. The relationship between saddle, crank and rear wheel axle are the decisive factors for the climbing behaviour of a bike. The GeoMetron concept combines 5perfect handling with optimum climbing behaviour. The rider is integrated into the bike through the long reach, the steep seat angle and the long wheelbase, so that the centre of gravity lies optimally between front and rear wheel axle. All GeoMetron models are built with short stems, so that the rider has a relaxed and comfortable seated position despite the long top tube. These advantages are clearly noticeable not only for the professional, but also for the beginner. We build our bikes because we want to ride them the same way. Nicoali bikes are known for their “industrial” design. The tensile strength of 7020 compared to 6061 aluminium is about one third higher. The elasticity is about one fifth higher. These properties, coupled with high quality welding, result in a bicycle frame that is far superior to the average in terms of durability. In comparison to carbon, aluminium is much more robust and tough, so that bottom contact, falls or stone impacts cannot harm the structure. On the homepage (www.nicolai-bicycles.com) you can now order the EBOXX Bike as a complete bike. Carefully considered components offer the following two models. On one side a bike with classic derailleur gears and on the other side the so-called EBOXX E14 with Gates Carbon Drive. 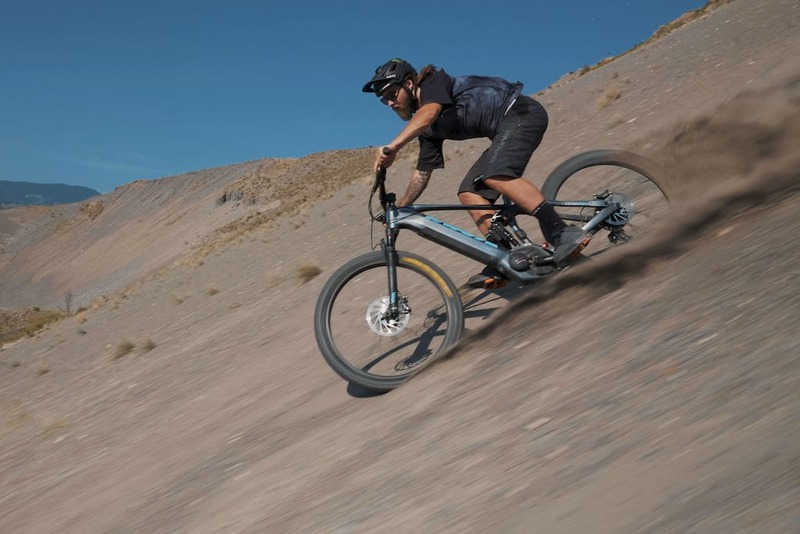 Video: Watch Graham Agassiz Ride On E, Kona Remote CTRL e-Bike That Is! Why why why the mondraker kink in the top tube? I normally like nicolai kit, and given the “industrial” look of most of their frames would have thought they’d get away with the battery and motor quite well in comparison with others but by heck that’s ugly. They’re not going to win a Blue Peter badge for that monstrosity, FUGLY! kin awful, 9000???? you’d have to be off your rocker to spuff that much on this monstrosity.